Even during the fighting in Afghanistan and then in Chechnya, the Russian military had repeatedly noted that the 30 mm gun of the BMP-2 is too weak when challenging an enemy hidden behind concrete shelters and thick walls of buildings. Then there is the 100 mm gun of the BMP-1, which is not very accurate in the mountains. In spite of its impressive size, it was created “for the destruction of enemy personnel nestled in long field shelters or buildings made of brick”. Taking note of the military’s emerging needs, Russian engineers proceeded on two paths –- the evolutionary and the revolutionary. The evolutionary path has led to the creation of the new combat unit Bakhcha-U, developed for the BMP-3 and BMD-4, and for the modernisation of the BMP-2. The module received twin guns – 100 and 30 mm. Moreover, a missile can be launched from the 100 mm gun, which means enemy bunkers can now be destroyed. This innovation has been implemented not only in the Russian military, but also in ten other countries. Nevertheless, the Russian BMP still has one very significant drawback. With its weight of 18 tonnes, this vehicle does not provide adequate security for the crew during shelling from modern artillery. Based on its own experience and other local conflicts, Russian arms manufacturers finally realised that a heavy BMP was needed. In Russia, for a long time they could not abandon the concept of floating transport for the infantry, and therefore, the development primarily focused on foreign markets. During the time of rapprochement between Russia and France after the events of 2008, among the joint endeavors was the Atom project – the creation of a wheeled heavy armoured personnel carrier. 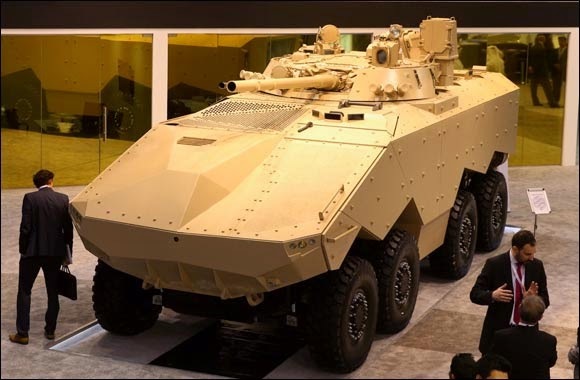 The Russian company Burevestnik was to create the combat module, and France and a company owned by the Swedish concern Volvo – Renault Trucks Defence – was to provide the base in the form of wheeled infantry fighting vehicle (BMP VBCI). The prototype of this was presented during the Russian Expo Arms-2013 defence exhibition. This sample, to an extent, shocked visitors, with its futuristic look and a naval gun. That is what Burevestnik used when creating the new Soviet S-60 57 mm anti-aircraft gun, which was produced in the 1940s and has been repeatedly upgraded until it became the A-220M, now used on board naval vessels. The 57 mm anti-aircraft gun, with a range of 12,000 meters and firing rate, in the design used on ships, of 300 rounds per minute, quickly demonstrates the combat power of the BMP. The S-60 became obsolete as an anti-aircraft gun during the war in Vietnam, but when working on the ground, it is the embodiment of sheer power. During the fighting in Syria, the old S-60s have shown their ability to destroy enemy troops, even if they are behind strong fortifications. Equipped with modern mechanisms and sighting equipment, this gun could have become an excellent alternative to the current 25-mm guns in the combat vehicles of the French infantry. However, on April 8, 2014, the Swedish company Volvo forced its subsidiary – Renault Trucks Defence – to stop working on the joint project, due to the sanctions that the EU imposed against Russia. On February 22, 2015, Oleg Sienko, General Director of Uralvagonzavod, which includes the company Burevestnik, said that work on the Atom armoured vehicle would continue with a new partner, and a new module for the BMP has already been created for a specific customer. During the recent military exhibition in the UAE, the IDEX-2015, Russia’s Industry and Trade Minister Denis Manturov announced the creation, jointly with the UAE, of a 57 mm gun system. 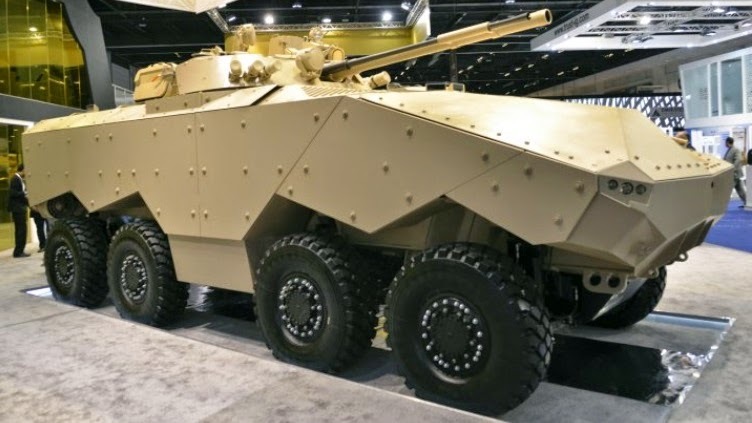 The base for the Russian military module will be created in the United Arab Emirates, on the chassis of the Finnish Patria AMV heavy BMP with the 8x8-wheel configuration, as well as the French VBCI. 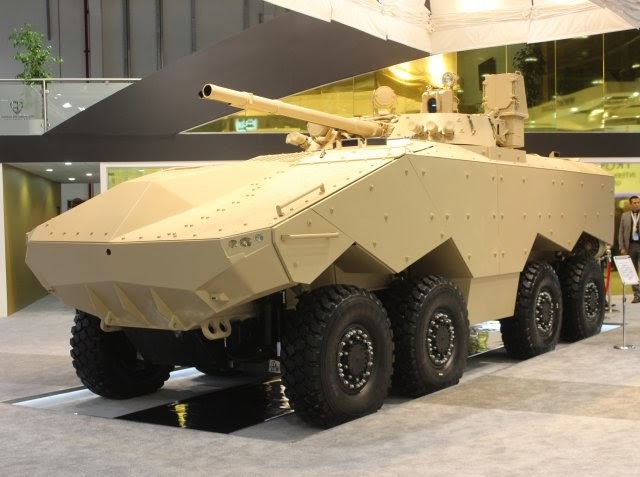 It is interesting to note that the “revolutionary” 57 mm gun on the Emirati armoured vehicles will be replaced by the “evolutionary” Bakhcha module, which is already well known in the Arab country, having already purchased a great number of BMP-3s.